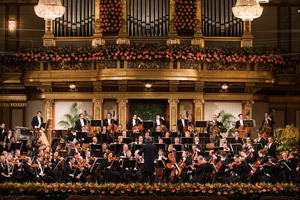 The annual Easter Concert is one of the highlights of the season in Vienna. This year, it makes a switch from its usual place of residence, the Great Hall of the Musikverein, to the Wiener Konzerthaus. Audiences first stepped into the Wiener Konzerthaus on 19 October 1913. The programme that day featured a new work, Richard Strauss’ Festliches Präludium, coupled with Ludwig van Beethoven’s Ninth Symphony. The concert set the template for the Konzerthaus’ artistic direction, which still holds today, combining tradition with innovation. The architects of the Wiener Konzerthaus ensured that it would be a venue able to grow and adapt to new developments in music over time. Its original three halls were designed to be used both separately and together, if a performance demanded it. A fourth concert hall, the Berio Hall, was added to the Konzerthaus when it underwent its last major development between 1998 and 2001. 'Springtime in Vienna’, the title under which this annual Easter concert is presented, is performed by the Vienna Symphony Orchestra, but it offers a varied programme, so regular attendees and newcomers alike will find something to delight them. Over the many years that the orchestra has enchanted audiences at the Musikverein, numerous famous conductors have taken charge, including the likes of Georges Prêtre, Herbert von Karajan and Wolfgang Sawallisch. The Vienna Symphony Orchestra is one of the most acclaimed ensembles currently performing and it is made up of some of the foremost musicians in their respective fields, from percussionists to woodwinds and from strings to the brass section. In addition to regular members, the orchestra also frequently features highly-regarded artists in residence, many with global reputations. No visit to the city that is most associated with music is truly complete without a concert given by Vienna's foremost performing symphonic orchestra.